I've spewed a lot of vitriol against Michael Bay in the past. I've called him a hack, I've openly criticized his cinematography and stylistic tendencies for being lowbrow and shameless, and I've accused him and his screenwriting cronies for ruining the Transformers franchise, to say nothing of the horrible, horrible slasher film remakes that his cohorts at Platinum Dunes keep churning out. And that's not even getting into his fetish for all things military and masculine. But even with all that, I can admit that there is something about the man that if he's placed in the right environment, he can work as a director. The Bad Boys movies worked in this regard and (arguably) so did The Rock, less as deconstructionist pieces and more as direct wires into certain parts of the masculine psyche, which tend to alienate critics but draw in the cultural demographic that tends to make his movies a massive success. But the odd thing that I've always found with the movies Bay has actually cared about (Transformers is a franchise he has admitted he's only doing for the money), it's hard to draw the line whether or not Bay empathizes with his meathead characters or wants us to openly despise them as much as he does, putting every inch of their depravity on screen for us to either ogle or recoil away. To some extent, I think he's intending for us to do both, and that can make for a fascinating watching experience, particularly when he hires good actors to play the part. And so I approached Pain & Gain with a certain amount of trepidation, but at the same time a bit of hope. This film has been a passion project Bay has been trying to make for years, put together on a minuscule twenty million dollar budget with all the actors taking pay cuts to participate. In fact, the only reason Pain & Gain got released at all was because Bay agreed to make another Transformers movie to give Paramount another ridiculous pile of money that those films bring in like clockwork. So this is a film Bay has fought for, a labour of love, a story that he had to tell and put on screen, probably one of the truest expressions of Bay as an artist. How does it fair? 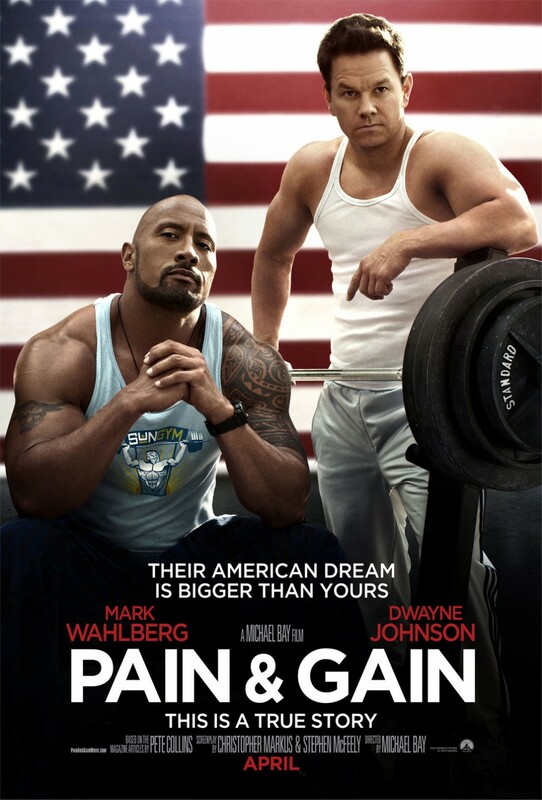 Well, I can say this for certain: while I definitely think Pain & Gain is a very good movie, I don't think it quite works all the way through - but funnily enough, I don't blame Michael Bay for that. To explain why is going to require some deeper analysis, but I do recommend you see it anyway, if only because it's refreshing to see a filmmaker like Bay actually trying and producing something that's at least interesting. The film tells the true story of Daniel Lugo (played by Mark Wahlberg), a bodybuilding trainer who convinces two other bodybuilders (played by Dwayne Johnson and Anthony Mackie) to kidnap a slimy millionaire (Tony Shalhoub) and get him to sign over his wealth. The scheme very quickly blows up beyond their control, and they sink to further depravities trying to get something out of it. It's a reasonably simple script, a black action-comedy that finally lets Bay get some use out of a hard R-rating. It's a dark, nasty little movie that seems to have erupted straight from the mid-90s, and it's the kind of film that's a natural fit for Bay's style. Setting everything in the debauched, oversaturated colour palette of Miami is a natural fit for Bay's lurid style, and you can tell there's a real ease and comfort for him shooting in this environment. In fact, I'll be blunt: there are parts of this movie that from a directorial standpoint, Bay really lets some of his chops come out, very plainly putting everything on the screen with some masterful camera work (there's a cyclic camera scene in one of the body builder's near the end of the film's second act that really stands out as reminiscent of Bad Boys II in a good way). While there are bits and pieces of shaky-cam throughout this movie, most of the film is shot very well with a crisp professionalism that I honestly didn't expect, showing some real artistry and symbolism in shot composition. Yes, for the most part what is on display can be reprehensible, but it is excellently shot. So now let's talk about the script and casting, which are elements I will definitely praise - but are also where the big problem is. So let's get this out of the way first: this movie is a lot more clever and funny than most are giving it credit, and for the most part, it matches Bay's direction for quality. It also helps the film inestimably that this film is based on a true story, which really is as utterly ridiculous as what Bay put on screen. Like anything based on a true story, it adds a bit of dramatic heft, and it helps that all the actors are bringing their A-game and are willing to sell that story. And while I will admit some of the humour does feel a bit off-colour, Bay has a way of getting around some of the tastelessness that's actually rather novel: that we get narration not just from Wahlberg's Daniel Lugo, but from all of the characters at various points, allowing us to get a richly varied view of events. But this tactic also serves another purpose: it provides audience perspective. By throwing everybody's narration up on screen, it allows us to gain a bit of distance from Mark Wahlberg's myopic pursuit of his version of the 'American Dream' and get some perspective from our reality. Namely, that Daniel Lugo and his gang aren't antiheroes, not knights errant robbing a despicable man, but lying, violent, disgusting, amazingly stupid dipshits (as emphasized through the one 'good' character, a private investigator played by Ed Harris). They behave like sexist, racist, homophobic assholes, and by cutting away to alternate narration, Bay forces the audience to confront this time and time again. And with that comes the crux of Bay's message, a burning indictment of the hypermasculine idiocy these men have embraced. They aren't intended to be role models or characters we aspire towards, but the very worst offshoots of the steroid-abusing bodybuilding subculture, with Daniel Lugo's 'American Dream' rationalization taking direct aim at the culture of arrogant empowerment that allows these types to exist. And here's where we run into Pain & Gain's big problem, the one that arguably Bay couldn't quite control. The problem I'm going to call the 'Fight Club problem', because it's almost exactly the same issue that film has. I'm going to link to FILM CRITIC HULK's article on the subject here, because he does a much more professional job describing what I'm talking about, but I'll provide the gist of this issue below. Now, let me make this absolutely clear: I like Fight Club. There are plenty of great performances and satire within that film that make it definitely worth a watch. I say 'satire' because the violent, hypermasculine anarchism Brad Pitt's Tyler Durden promotes throughout the film is what Fight Club is condemning. Chuck Palahniuk's novel is not endorsing that lifestyle, but viciously satirizing it and ripping it to pieces for how shameful and pathetic it really is. It's the telegraphed sucker punch at the end of the movie that drives this home, the ending twist (which I won't spoil) that ultimately shows that the path Tyler Durden endorses is the wrong path. And yet after that film came out, real fight clubs sprouted up all across the nation, and the ending was deemed a cop-out by fans. Why? Well, this is linked to two factors: the charisma and chemistry between Edward Norton's and Brad Pitt's characters, and David Fincher's direction. The first is a testament to great acting and a very solid script, that presents the anarchism of Durden's message in an appealing way - an appeal only strengthened by Fincher's direction. David Fincher is a filmmaker that possesses a strange, uncompromising sincerity behind the camera, and the way he shoots the movie makes the message Tyler Durden promotes sound very attractive and alluring. He wants us to get lost in that world, embrace it - even though the punchline later in the script will ultimately gut that world. You can see this across all of Fincher's films, where he is completely unafraid to show stark, horrifying vistas that enthrall and inspire, even despite the narrative purpose of the script to say otherwise. And while is a testament to Fincher's skill for creating evocative imagery, it runs in sharp contrast to the message promoted by the script. Let's compare this to Paul Verhoeven, the guy behind Starship Troopers and Robocop and Total Recall, and one of the few filmmakers that knows how to execute a good satire. Starship Troopers is a prime example of this, where people confused Verhoeven's satirical adaptation of Heinlein's militaristic novel with a genuine endorsement of militarism and fascism. Now, granted, this can be an issue with the adaptation of Heinlein's work and the underlying message of that book, but that's getting a bit off-message. The key point is that Verhoeven was looking to create a satire of the militaristic culture and fascism, and he did it by forcing audience perspective through news advertisements spaced throughout the film that were borderline hyperbolic. By inserting this form of overblown propaganda into the film, he triggers a recoil from the audience, causing them to back away and realize the ugly truth. David Fincher, on the other hand, never actually triggers this reaction throughout Fight Club until the very end, which is why a lot of people consider the ending to be a cop-out. So much to my surprise, Michael Bay's Pain & Gain has the exact same problem as Fight Club. In fact, I'd argue Bay does a bit better than Fincher because through the use of multiple narrations, he pulls the audience into multiple perspectives and drives his point more consistently that Daniel Lugo and his gang are stupid, despicable human beings and the culture that supports them is rotten at the core. But even with that, Bay still falls into the same trap as Fight Club does, albeit a bit less so, and this is due to two main factors: the charisma and chemistry of Mark Wahlberg and Dwayne Johnson; and Bay's own uncompromisingly sincere filmmaking. This is not saying that Mark Wahlberg and Dwayne Johnson did badly- far from it, actually. Wahlberg and Johnson both sell the hell out of their roles, with Mark Wahlberg's inadequacy complex and desire for a normal, 'all-American' lifestyle and Dwayne Johnson's religious sincerity warring with his tendencies towards sleaze and cocaine. And the film does not shy away from the despicable acts of torture, murder, and mutilation that both of these men commit, nor from the fact that neither men are overburdened with all that much intelligence. But here's the problem - Wahlberg and Johnson have enough natural charisma and likability on their own that it becomes hard to hate them as the villains. They do terrible things, but the earnestness of their performance and their unbelievable stupidity at points makes it hard to hate them rather than pity them. And this is coming from somebody who isn't enamoured with gym culture or the machismo these two have embraced - to an audience member in Bay's target demographic, odds are they won't see how terrible these two are, but rather two somewhat sympathetic idiots that 'did what they had to do'. This is only emphasized further by the fact that the people Wahlberg and Johnson are targeting are sleazy, generally unappealing assholes that actually seem to cast Wahlberg and his gang in a more appealing light - which runs rather to the detriment of the script's intent. And this isn't helped by Bay's direction, although I'd argue the problem isn't nearly as bad as it was with Fincher. The issue becomes with Bay's choice to put everything on screen without compromise, because while he does do more to show the seedy stupidity of his characters and setting, he also doesn't shy away from the wealthy debauchery that is Daniel Lugo's attractive goal, which can indeed be enticing. Hilariously, in comparison to Harmony Korine's Spring Breakers (which is a better film, I'd argue), Bay does a lot more titillate rather than desensitize - he shows the same sort of fantasy, but cuts away at the right points to emphasize that fantasy and make it all the more attractive. And while that does add support to why Wahlberg would want entry into such a world, there are points where it doesn't quite do enough to show the underside of that debauchery, add the necessary subtext to underscore the hollowness of Wahlberg's motivations. This is partially an issue with the script featuring so many incredibly stupid and despicable characters who are incapable of that insight, but I will say that with the multiple narrators, it came very close to making it work. It's a film that wants to have us rooting for, laughing at, and actively despising the main characters, and while there are points where that does kind of work, more often than not it doesn't quite nail the balance. All of that said, I can still recommend Pain & Gain as an entertaining, sleazy little movie that's arguably the best film of Michael Bay's career. It definitely feels like a labour of love and a passion project, and that effort definitely shows. While I'll admit I don't think the movie quite works all the way through, it's still a well-directed, interesting, frequently hilarious bit of sleaze that has something to say, and I liked that. The acting is solid, the direction is spot-on, the cinematography is deft, the soundtrack is excellently chosen, and while the script could be a bit better, it's probably the best thing Michael Bay's been associated with in years. So yeah, nice job, Michael Bay. Not sure it'll be worth suffering through another godawful Transformers movie for this, but it's nice to see you trying again. Nice review Mark. Granted, there are jokes involving penises that fall flat because they have Bay written all over them, but the movie made me laugh more than I expected.